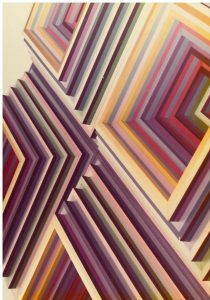 Harriet Febland is known for her vibrant, geometrical sculptures that catch your eye. This was certainly the case with her Corcoran file which included exhibition catalogs and invitations decorated with photos of her artworks. Born in New York, she completed much of her education there attending such schools as the Pratt Institute, New York University, and the Art Students League. 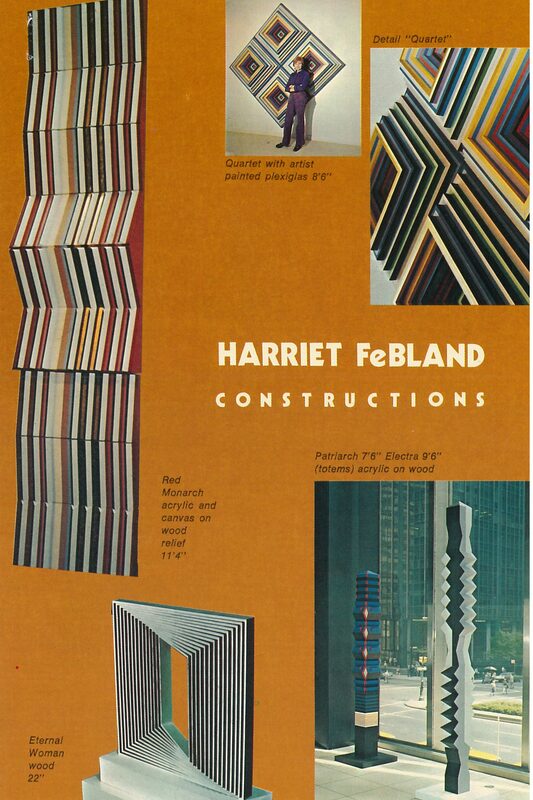 She spent 11 years in England studying and creating art throughout Europe but returned to the United States to continue her work as an artist and a teacher, ultimately founding her own teaching institution called “Harriet FeBland Art Workshop” in 1963 which she was director of until 1993. She donated some of her papers to the Archives of American Art. While FeBland has created artworks using all kinds of materials, she is particularly well known for her use of plastics in her sculptures. One example of this is her sculpture “Quartet” which is a geometrical wall relief created out of painted Plexiglas. 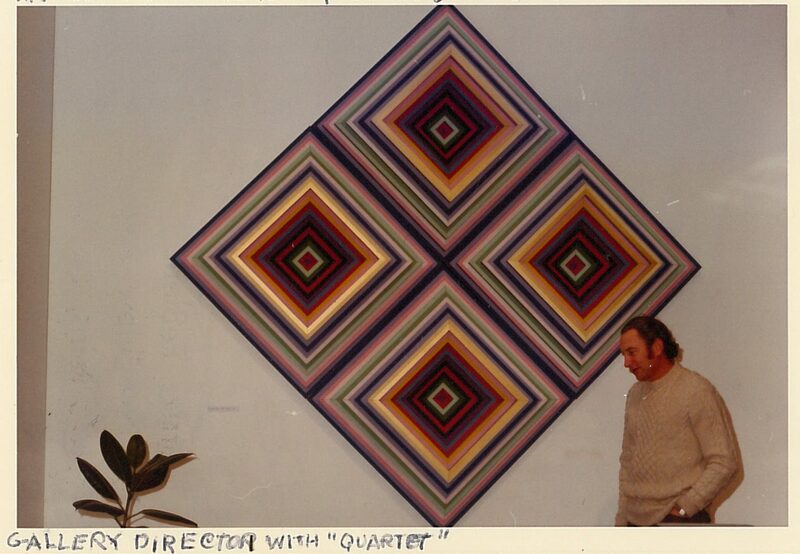 Her Corcoran file includes a postcard announcement for her 1974 show “Totems” at the Ward-Nasse Gallery, which includes an image of “Quartet”. 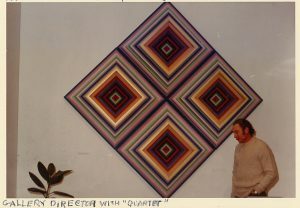 Also in the file were photos of the piece installed in a 1972 show “Women in Art” at the Brainerd Art Gallery Museum, State University of New York, Postdam. The photos are great opportunity to see the installation of the piece as well as to see the people who were involved in the curation of the show, such as the director Benedict Goldsmith who is present in some of the photos. The photos also give a reference to what the true colors of the sculpture were. The color of “Quartet” in the photos differ from those of the image used in the invitation. While the true color may be somewhere in between, photos like these give researchers the ability to compare images of art and determine certain details about the work, including color. 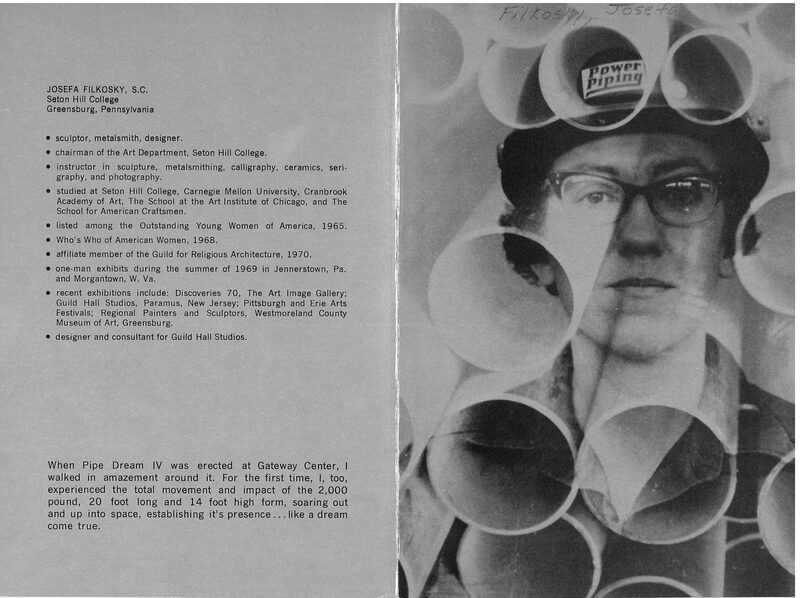 Inside of exhibition pamphlet for “Pipe Dreams” at The Art Image in All Media Gallery in New York in 1970. Another sculptor known to use unusual materials in her sculptures was Josefa Filkosky. Originally born as Patricia Filkosky in Westmoreland City, Pennsylvania in 1933, Filkosky change her name to Josefa when she became a nun. She went to Seton Hill College in Greensburg, Pennsylvania for her B.A. in Fine Arts, and continued to study sculpture and metalsmithing at several other institutions. While in desperate need of funding for her art, Filkosky was able to make an arrangement with the vice president of the Power Piping Company, C. Allen Harlan, who was a fan of her work. In 1969 the company, located in Pittsburgh, provided her a grant as well as access to materials as well as crew members to make her monumental sculptures. [i] The use of pipes in Filkosky’s sculptures can be seen as a tribute to the industrial economy of her home state and as an effort to bring these utilitarian objects into the larger art world. From this opportunity with the Power Piping Company, Filkosky created her Pipe Dreams series. The series was shown throughout the United States, and some of them also became permanent pieces of outdoor sculpture, particularly in Pennsylvania. Her Corcoran file has a pamphlet for her Pipe Dream show at the Art Image in All Media Gallery in New York in 1970. 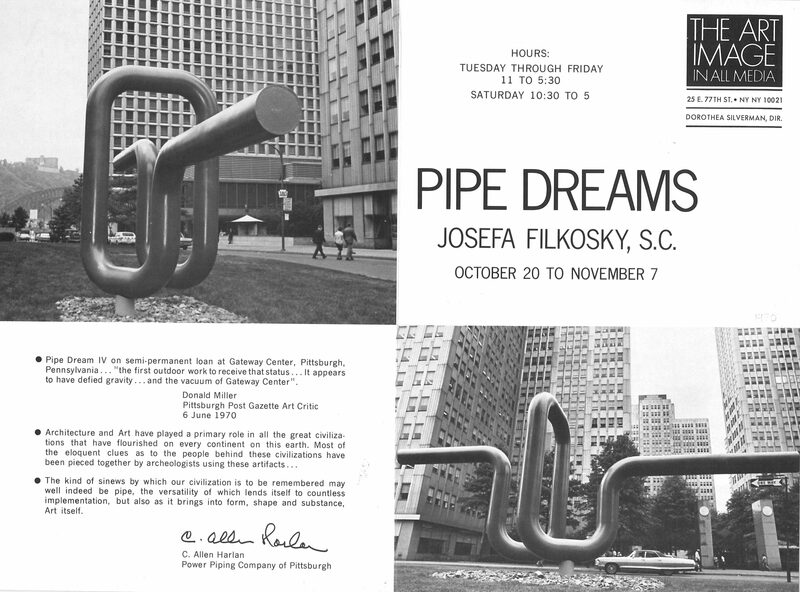 The pamphlet gives some biographical information on Filkosky while also emphasizing the importance of her art to Pittsburgh. Outside of exhibition pamphlet for “Pipe Dreams” at The Art Image in All Media Gallery in New York in 1970. 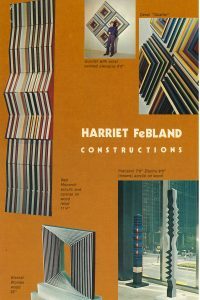 Looking at the front cover of the pamphlet, the overlaying of the photo of pipes over the photo of her wearing the Power Piping hard hat highlights her role as a woman sculptor working with materials often associated with a male dominated field. This images also seems to note a sense of pride for working with materials from her home state, which gave her the ability to create the kind of art she was really desired to create. Filkosky continued her career as an artist and as a teacher and died in 1999. [i] Miller, Donald. “Sister Josefa’s Pipe Dreams.” Art International, vol. 15, no. 10, 1971, pp.50-51.